a part of standard precautions for all health care workers to prevent skin and mucous membrane exposure when in contact with blood and body fluid of any patient. Personal equipment includes protective laboratory clothing, disposable gloves, eye protection, and face masks. See also Standard Precautions. 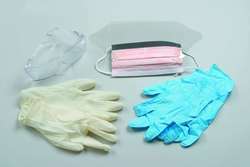 Personal protective gear Infection control Specialized–ie, not 'standard issue' clothing or equipment worn by an employee for protection against a hazard, in particular blood-borne pathogens Appropriate PPE Gloves, gown, lab coats, face shields or masks, eye protection, mouthpieces, resuscitation bags, pocket masks, or other ventilation devices. See Double gloving, Gloves, Handwashing, Mask, Shield, Spacesuit. Specialized clothing or equipment (e.g., gloves, lab coats, eye protection, and breathing apparatus) used by workers (e.g., emergency medical services personnel) to protect themselves from direct exposure to blood or other potentially hazardous materials to avoid injury or disease. Clothing, masks, gloves, or other gear that protects a person from exposure to noxious chemicals or transmissible diseases. Copies of Personal Protective Equipment at Work Regulations 1992 (as amended), ISBN 0 7176 6139 3, price 8. When leaving the pre-isolation room, the physician and the PIU were sprayed with a sodium hypochloride solution before the first layer of personal protective equipment was removed. Is all personal protective equipment provided at no cost to at risk employees? Intertek (LSE: ITRK) a leading international provider of testing, inspection and certification services, today announced the expansion and upgrade of their Center of Excellence (COE) specializing in Personal Protective Equipment (PPE) in Cortland, NY. ESAB a world-leader in welding and cutting technologies, has published a new catalogue, PPE and Welding Accessories, covering personal protective equipment (PPE), welding tools and accessories, and special process equipment. are covered by the Personal Protective Equipment at Work Regulations 1992. Clow provided the personal protective equipment and guidance needed to run a safe facility. We review this hospital's response to, and management of, this outbreak, including such factors as building preparation and engineering, personnel, departmental workload, policies and documentation, infection control, personal protective equipment, training and education, public health, management and administration, follow-up of SARS patients, and psychological and psychosocial management and research. In the past, protecting employees from bloodborne pathogens primarily involved personal protective equipment (PPE), such as gloves, masks, and protective eyewear. In cases where data on personal protective equipment use were available, 65% of illness and injury fell to teens who were not using safeguards.